I love going to nursing conferences. My first nursing conference was in 2010 during my second year as a nurse. It was a PCCN/CCRN review course with Laura Gasparis Vonfrolio in Park City, Utah and I just loved being in the same room with hundreds of other nurses who were all there for the same reason as me: to invest in themselves and pursue professional development in their career. And to have a good time, of course. This time, I was in a room with thousands of other nurses! NTI is such a well organized event and it has quickly become one of my favorite nursing conferences to go to for several reasons! I'm going to break down those reasons for you in this blog post and help explain what NTI is all about in case you're considering to go in the future. I was lucky enough to attend NTI in Houston, TX in 2017 and knew I'd regret it if I didn't make it to Boston this year. I requested my time off early at work, made sure I had enough PTO saved up, and I completed the documents required to be reimbursed for the continuing education. This was my first time in Boston and I was able to do a little sight seeing before the conference! I met up with my travel nurse friend and the two of us explored the town: Faneuil Hall, Paul Revere's house, we took a tour bus around the downtown area, we took the subway (and met the sweetest dogs! ), saw a ton of amazing architecture, and ate amazing food! One of the best parts of the week was getting to listen to live jazz on our last night in Boston. We met new friends, went to dinner, listened to music...it was magical, the kind of night you always remember. In case you're curious, AACN is planning on Orlando for 2019, Indianapolis for 2020, and San Diego for 2021! Think of the adventures you could have! Insider Tip: Check with your employer to see if they'll help cover conference costs! Whether it's a professional development fund or reimbursement for CEs, there may be something in place to help support staff with the financial end of things. If you're a member of AACN, there are scholarships you can apply for and if you're part of an AACN local chapter, there may be scholarships to help with registration as well. NTI is the PERFECT opportunity to meet some of the approximately 9,000 nurses from all across the country! And if you're lucky, you'll meet up with some online friends that you would never meet up with in person UNLESS it was for something like this! The networking opportunities are limitless. I went to Houston by myself, so it's totally possible to have a good time even if you're traveling solo! First of all, you share something in common with everyone you meet (the whole nurse thing) and second, you're sharing an amazing experience together! Let's just say it's not hard to strike up a conversation with a stranger who will soon become a new friend. This year I was got to meet SO many amazing people! Danielle @nurseabnormalities, Cindi with the AACN Certification Crew, Rachel @thenursetribe, Jasmine @jasminestarr05, Jon @technursejon, Marissa @lipstickandlifesaving, Kati Kleber @kati_kleber, Christiaan @redbearrn, Blake @nurse.blake, Fiona @abstrctevlbrbie, Nicole @nicolekupchik. Insider Tip: make plans EARLY! You want to figure out lodging and transportation sooner than later, they actually SOLD OUT this year at NTI, so no procrastinating! Hotels and airbnbs were snatched up quick and if you want to stay at a location near the conference, you'll want to be on top of this. I highly recommend staying nearby for several reasons, but the most obvious one is that the transportation time to and from your hotel cuts into time you could be spending getting a little more sleep in the morning or getting in one more education session at the end of the day. And if you need a wardrobe change before the certification dinner or before Nurses Night Out, it's easier to do that if your hotel isn't 20 minutes away. Just my personal thoughts on the matter. There are SO, so many education sessions you can sign up for. Over 275 of them, as a matter of fact. These are all taught by volunteers who work hard to bring relevant and cutting edge topics to YOU. This is where you get to choose your own adventure: you get to pick and choose the classes you want to attend. You can choose the ones that spark your interest or select the ones that are covering topics that cover issues that pertain to the unit you work in. To quote a friend, it's like drinking from a firehose- there's SO much coming at you, you just do the best you can with it. -Top Sepsis Studies 2017-2018: talking about the new 1 hour sepsis bundle! -Nicole Kupchick's "Critical Care Studies You Should Know About." She's a phenomenal educator and if you follow her on Instagram or Facebook, she is always sharing new information, including the topics she covered at NTI in this talk! - Critical Care Nurse Workplace: Preliminary Results of the 2018 AACN Healthy Work Environment Survey. AACN has been conducting surveys with critical care nurses for years regarding healthy work environments and they are close to publishing the 2018 survey results! We got a sneak peek at NTI and while the study indicates majority of nurses are staying in the profession, there's still a decent amount who are looking at leaving their current job to do something else within the nursing world and this is where organizations and managers can look for ways make positive changes to their workplace environment to promote retention and job satisfaction. More to come once the results are published! -One of the best tweets of the conference came from The RN Mentor who listened to the session, Stressors out of Pressors: "Initially titrate a pressor like you're taking a shower. If the temperature is way off, make big moves, as the temperature gets closer to your goal, slow down titration as you close in on your target." -Bryan Boling presented on a topic called "#ICU: Moving Beyond the Classroom with Social Media." Again, AACN is all about keeping things relevant and the topic of using social media to educate others is huge! All about the FOAMed (Free Open Access Medical Education). -There were sessions about what type of certification you should pursue or which graduate program you should enroll into. -Vicki Good, a former AACN president, spoke on Resiliency Tips and Strategies to Manage Moral Distress and Burnout Syndrome (a topic near and dear to my heart). -There are education posters everywhere! Take some time to look at those. Units from all over the country are presenting their evidenced based findings of best practices they've discovered and it's another hidden gem you need to check out! You never know what information you'll find that can be brought back to your unit. I was one of three lucky people who was asked to be an NTI social Media influencer this year! Jon @technursejon, Marissa @lipstickandlifesaving, and I would meet up at the end of each day to do a live video recap of the day and talk about our favorite sessions. 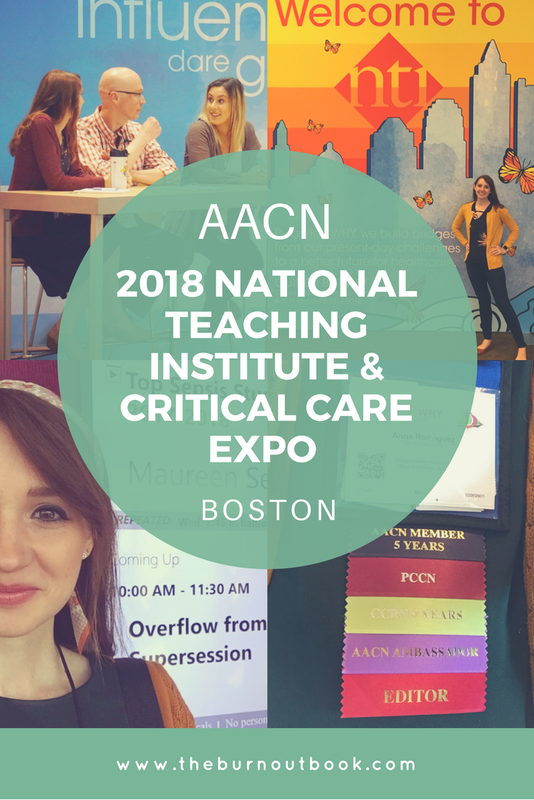 We always tried to offer some advice to people attending for the first time too, and you can see a recording of the live videos on AACN's Facebook page. This is just a small sample of the various topics and sessions that I went to, but honestly, you can learn about almost anything at NTI! There are sessions specific to pediatrics or NICU and sessions about ECMO or other ICU specific therapies like CRRT or hypothermia. There are sessions for new grad nurses who are just beginning their career, ones for expert bedside clinicians, and everything in between. Insider Tip: Plan your sessions BEFORE you get to NTI! Get on AACN's website and take a look at all the NTI sessions that are being offered. You can separate them all by topic or by day it's taught and create a tentative schedule. This doesn't lock you into going, you can always change your mind and attend something else. It's incredibly helpful to have these classes on your schedule though, because when it comes time to complete evaluations in order to get your CEs, this is one quickly way to make sure you didn't miss anything. There were around 400 exhibitors to visit during the conference and it's almost impossible to meet them all! There's everything from major medical companies presenting their latest technology and equipment to universities sharing information about the various nursing degrees they offer. There's free massages, coffee, tons of freebies/raffles/drawings, and all the pens a nurse could want! The Expo is really popular and nurses start lining up well before it's scheduled to open, sort of like a Black Friday sale. Thankfully, nurses have spacial awareness and don't want to do any first aid on their day off, so no one gets trampled. Don't forget to take advantage of all the photo ops while you're in there! Insider Tip: If there's a certain company you want to talk to or a specific freebie you want to get, prioritize those when you first get into the Expo! It's so easy to get distracted (and a little lost) once you get in there! For example, the FIRST place I went to was the massage chairs. It was heavenly after taking a red-eye flight for 6 hours to get to Boston. Throughout the whole conference there are moments when local chapters, hospitals, and individuals are recognized for their achievements. It's usually during a super session (the one with the key note speakers and most of the attendees gathered in one place) and it's so inspiring to see and hear what others have contributed to their workplaces and to the nursing profession. Each year at NTI, there is an optional Certification Dinner that you can attend (for a bit of an extra fee). They serve dinner, you get recognition as a group for the certification you have, there's a gift (a special NTI mug), and there's dancing at the end! When it comes to meaningful recognition, AACN has it covered. Insider tip: Go find the Certification Oasis while you're at NTI! First of all, it truly is an oasis, it's the perfect spot to escape the crowds if you just need to sit down and relax for a minute. They'll frequently have coffee and water down there, and if you're lucky, you'll catch them when they're serving some cookies or brownies! Second, the ladies at the Certification Oasis are a WEALTH of knowledge! I met several of them when I participated in the exam development committee earlier this year. They can help guide you in your certification journey, answering questions and providing resources. Conference attendees also get access to the AACN certification review courses for FREE! Some of the courses are $100+ so if you time it right, your registration fee can go a long way if you take advantage of this offering. It's usually for only a few months post-conference, so plan ahead! And before you leave the oasis, grab a couple pens and certification buttons! These are some of the best pens you'll find at the conference, and I've tested many of them. Overall, I heard very little negative feedback of the event. There were requests for more coffee (for some reason, it became difficult to find coffee after 2pm when the food areas closed down) and occasionally some long lines to get food or for the restrooms. Everything you'd expect to find in a crowd that size. I have a little highlight reel video I put together if you're a visual person and want to see more pictures/video clips from the conference! Enjoy. If you've attended NTI in the past, please leave a comment with your favorite parts about the conference and any tips you think would be helpful for a newbie! See you in Orlando at NTI 2019!